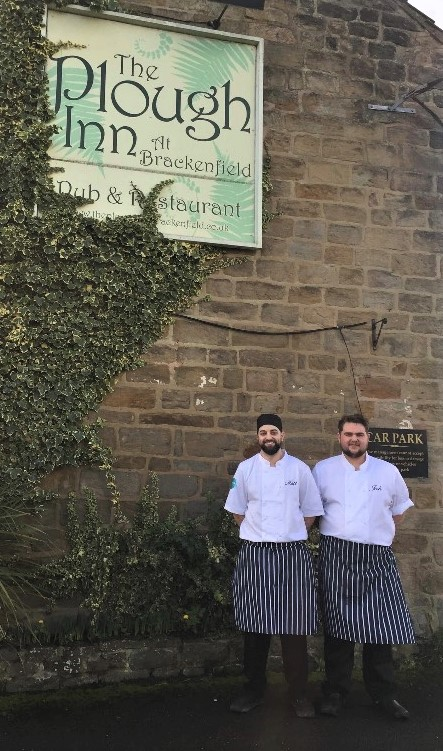 Steve Brough and his wife Amira, have a clear vision for their new family venture, moving into the Plough with their son Josh (Head Chef), daughter-in-law Laurel (front of house) and their three grandchildren (aged 1, 2, and 4) early this year. Steve told us that he loves the area, which shares the peace and tranquility of rural Scotland, even though only 3 miles from Alfreton. With a 20-year lease, they have many ideas to develop the business and have already attracted widespread support from the friendly, local community, including snow clearing in the car park by a neighbouring farmer. Steve has introduced a range of real ales such as Old Golden Hen, Abbots and a bespoke beer, The Plough Inn Ale, on sale at £2.50 per pint. Speciality flavoured gins are available at the “Gin O'Clock” bar. Josh has a lifelong passion for cooking and since training as a chef has worked at the Hurt Arms, Charles Cotton Hotel and a range of top flight London restaurants. Fresh homemade food and sauces, using locally sourced, high quality produce is the aim, already proving so popular that booking is essential for Thursday Grill Nights and Sunday lunch. Suppliers include Crich Butchers (who make a special sausage using Plough Inn Ale) and bread from the Loaf. Steve plans to start a vegetable garden to supplement veg from Matlock. We visited on a Wednesday lunchtime and the restaurant was busy, with a really good atmosphere, keeping the two full-time chefs and staff on their toes. The family have made an impressive start in a few short weeks and are keen to be part of the Brackenfield community. We wish them well.